Welcome to my review of my 2017 bus activities in both Ireland and Great Britain. This page will show a few highlights of each month, with links back for those who wish to delve deeper. It's been an interesting year, with the NTA in Ireland taking a more prominant role, including the appearance of their branding on local services, while in Nottingham a place I knew well has closed and subsequently been demolished in the shape of the old 1970s Broad Marsh Bus Station. 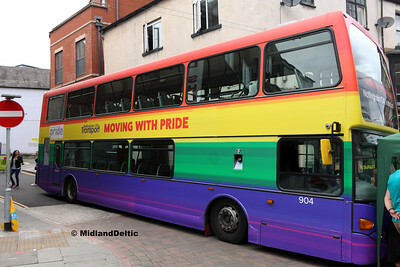 Also in Nottingham, a major move away from diesel has taken place. At the start of the year was the annual Christmas / New Year visit to family and friends in Nottingham. I always try and get at least one trip out with the camera! 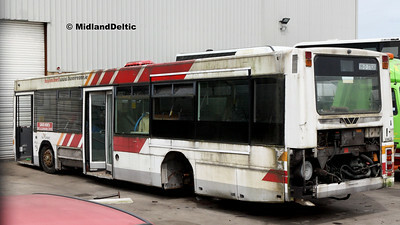 Here we see a rare bus type in a now vanished location. TrentBarton were the only UK buyers of the SR version of the Tempo, using a batch on their i4 service between Nottingham and Derby via Stapleford and Sandiacre. 335 is seen on the 3rd waiting for departure time with a short working to Sandiacre. 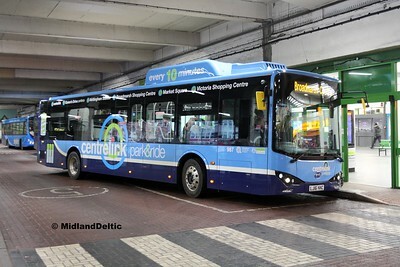 Also seen in Broad Marsh Bus Station on the 3rd was this BYD electric vehicle, purchased by Nottingham City Council and operated by Nottingham Community Transport as their 987, initially on Centrelink services. The authority may have jumped the gun, in that these will remain virtually unique in Europe, as BYD have entered a partnership with Alexander Dennis to produce vehicles with this drive technology in the UK. They are also at odds with the main city operator (of which they are 88% shareholder! ), who see bio-gas as the way forward, as was to be demonstrated later in the year. As it happens, I got a second pass out from family duties, so along with my son took a day out in TrentBarton land on the 7th, using a Zig-Zag ticket to revisit some old haunts from my professional and personal life. Here we see Stagecoach 36006, liveried for the Sherwood Arrow service to Worksop, at what passes for Victoria Bus Station these days. I recall the changeover from the old site, which was in doubt right up to the last minute as the drivers' representatives were extremely concerned at reversing into a live general traffic area, with cars heading for the car park entrance. It went ahead on schedule in the end after some alterations to lining. 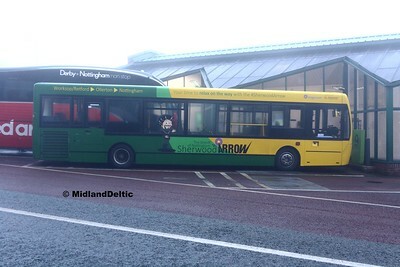 The Sherwood Arrow is a long-standing service, operating along the A614 to Ollerton then onward to Worksop. 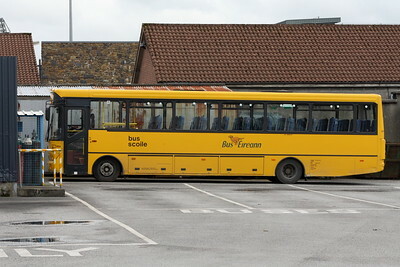 In times past there was also a 36 to Retford and Doncaster, but this is now a connecting tendered service from Ollerton to Retford as ever increasing car ownership and use continues to damage rural bus services. 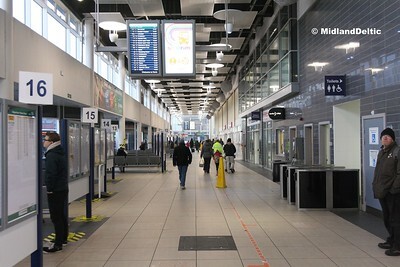 After a quick spin on a Red Arrow along the Brian Clough Way, more prosaically known as the A52, I paid my first visit to the new Derby Bus Station. Back in the early 2000s I was involved in planning and operator discussions over the facility, prior to the initial developer going bust. Working for the City Council, not only was I responsible for operation in the increasingly difficult old bus station and complaints about issues from the public it created, I was also fielding complaints over the proposed demolition and replacment with a modern facility. The issue was red-hot locally in the press to boot. I left just before the old facility closed and all services shifted to on-street locations, itself a huge organisational task requiring a lot of on-street infrastructure often in the face of the highways engineers who really didn't want any of it. The new facility appeared fine during our visit, but the outbreak of a bus war instigated by Your Bus has pushed frequencies above what is required on several corridors, and led to overcrowding of the facility and subsequent congestion in the area. 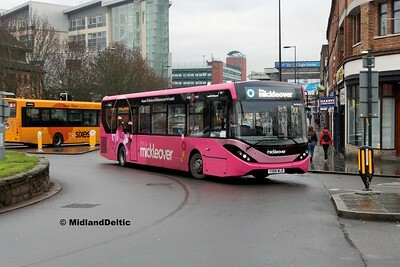 One of the reasons to visit the city was to see the new vehicles recently arrived on The Mickleover. Marking a break from a long period of Wrightbus bodies on Scania and Volvo chassis for large vehicles with Optare Versas and Solos for smaller capacity requirements, Alexander Dennis scored something of a coup with an order for Enviro 200s in two different lengths, long for the Mickleover and shorter for the Nines, the latter due to start operation a couple of days after our visit. Here 106 is seen turning off Morledge into Albert St with an outbound service. For some reason, some hired in Plaxton Crentros were seen operating for Arriva, possibly in repsonse to the competition from Your Bus. 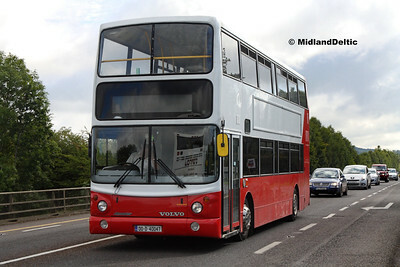 This example is seen departing on a 7 to Sinfin. The Arriva network appears to have changed significantly in several areas since my time here, and apart from the Chaddesen services I was struggling to follow what went where! A welcome sight at the Bus Station was one of the few Excels surviving with the Wellglade group, in this case 264 with Notts & Derby. 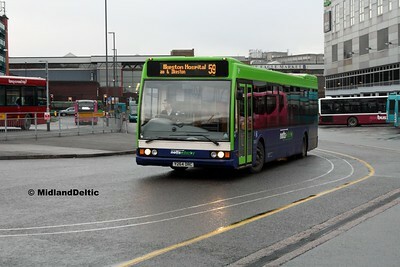 It is seen working a 59 to Ilkeston Hospital. The Excel was Optares first full size low-floor bus, but never reached the heights of their iconic Solo. It was not helped with reliability issues with early models, and competition from other models, notably the ever expanding Dennis Dart SLF with the Dart heritage behind it. That said, TrentBarton built up a signifcant fleet of them, and they have found buyers on the used market. Arriva have several levels of route branding. 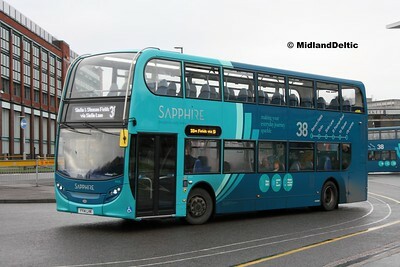 The 38 to Sinfin has the Sapphire version, seen here on Enviro 400 4406 departing the bus station. 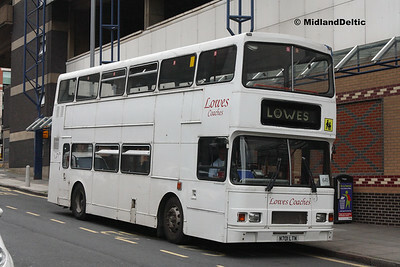 For a long time Arriva Derby struggled on with an increasingly aged fleet, including Volvo Citybuses (both ex Derby City Transport and elsewhere cascaded within the group) despite being one of the most profitable (on paper) parts of the operation. The reason for this was that because the vehicles were low value, depreciation was similarly low; new vehicles would push this amount up, and actually damage profitability! In the end, the low floor revolution forced change, and the fleet now appears about average in age terms. 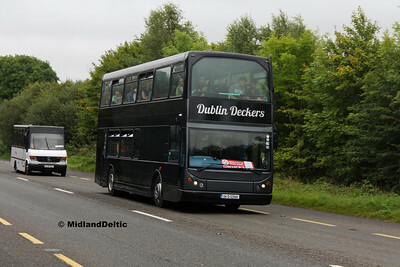 Back in Midlands Ireland, bus travel is not necessarily as advanced as elsewhere! 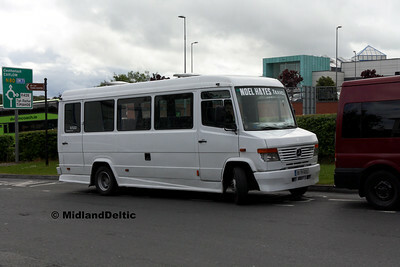 Mercedes-Benz Varios are diminishing in the UK, but form the basis of much rural transport in Ireland. This 16 year old example is seen in Portlaoise on the 31st. 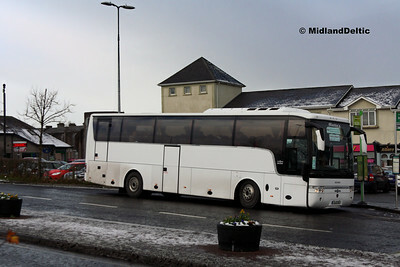 A rare visitor to Portlaoise was this Scania of Callanan Coach Hire, on a school charter to the Dunamaise theatre in Portlaoise. This combination is popular in Ireland, with both the state operator Bus Éireann and private operators utilising the type, both new and secondhand. 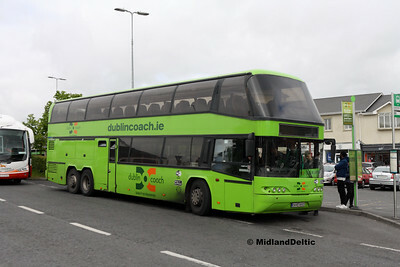 Dublin Coach enhanced their 726 service with additional journeys between Kildare town and Naas. 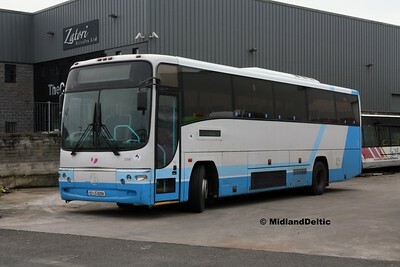 While the Portlaoise - Dublin Airport services continued to be operated by Neoplan Skyliners, Mercedes-Benz Citaros previously used on Airport car park work were drafted in to operate the extra short journeys. Still carrying the warning beacon, this dual door example with extra luggage racks is seen in Newbridge hading for Naas on the 17th. For once, an import which is easy to identify. Seen on the 9th at Universal PSV is former First Group 20500, now registered as 02-LS-6094. Universal PSV act as an importer and trader, as well as an operator, and there is often something new to look at on my trips round there. 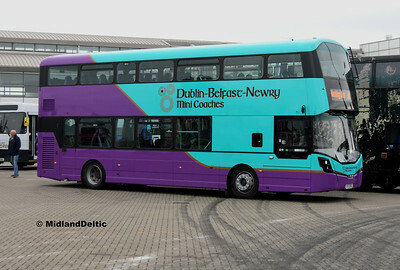 The Dublin Coach Neoplan Skyliners were beginning to show their age and mileage, with breakdowns and substitutions becoming more frequent. 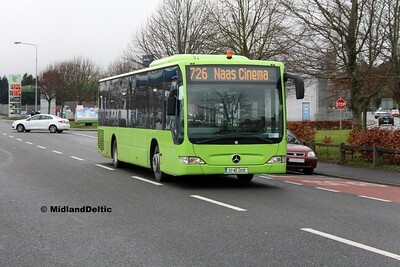 This example is seen on the 21st, between trips to Dublin Airport. Replacement was rumoured, and indeed some Van Hool Astomegas were delivered, but seemed for some time to be used largely on other services, leaving the Neoplans to struggle on with the 726. Lack of direct competition for the cash cow may be part of the cause. The 24th was a bright, sunny day so I decided to nip down to junction 17 to see if anything unusual was operating to duplicate private services to cope with the increased demand during the Bus Éireann strike. Nothing too out of the ordinary appeared in my spell there though! 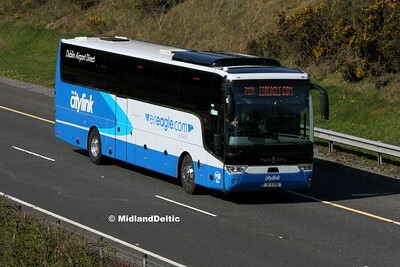 Eireagle is a trading name of Citylink, used for their Limerick - Dublin Airport service. The coaches are generally supplied by Callinan, Claregalway and here we see one of their Van Hools racing towards Dublin. 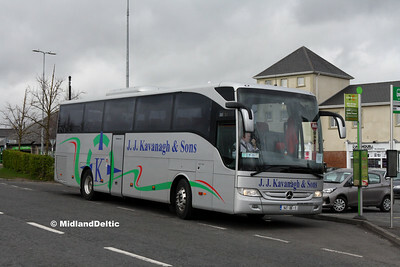 Seen on the 29th is the unique silver-liveried Setra, used by JJ Kavanagh as the Kilkenny hurling team coach. No trip to Croke Park for this one this year! It is seen on the new additional working, 1410 Portlaoise – Dublin Airport, which uses resources released since the service eased to operate between Limerick and Shannon. Back after a three week strike, LC4 is seen on the 17th working an X12 from Limerick to Dublin Airport. 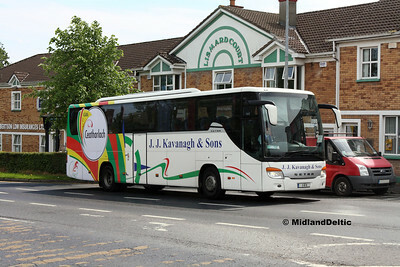 The strike forced passengers to use alternatives, and subsequent observation suggests that JJ Kavanagh have benefitted long-term with increased loadings on this route, despite the slightly slower timings covering towns no longer served by Bus Éireann. Three operators work between Dublin Airport and Portlaoise, and are seen here on a Bank Holiday Monday. Licensing rules mean that none of the services are exact matches, and local passengers from settlements between Portlaoise and Kildare have no direct service to Dublin City Centre. As a Bank Holiday, a Sunday service meant this 73 was actually going through to Longford, although sadly the driver insisted that Athlone was the correct display as the bus waits there for a period (10 minutes). This was after he had asked me somewhat suspiciously as to my motives in taking the photo - maybe the aftermath of the strike action. 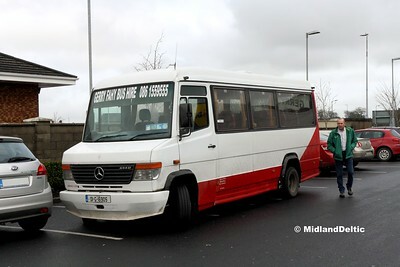 Many smaller operators in rural Ireland still operate with Mercedes-Benz Varios of varying ages and in varying condition. This example of Noel Hayes of Roscrea is at the better end of the range of presentation, looking very good for a 17 year old vehicle when seen in Portlaoise on the 16th. UK style PSVAR regulations have yet to reach Ireland, so such vehicles can still be found in public service. Another of the Neoplans is seen on the 726 on the 23rd. The route is quite a mix, operating as a local stage service with some rural running from Portlaoise to Naas, before operating via the N7 dual carriageway and M50 motorway to the Airport via the Red Cow LUAS stop. Not a bus I’d want to drive in that role! I believe this had transferred to a local operator, as the company in whose livery it is seen have a replacement vehicle. It was something different to see in any event. Second time lucky! Branded for Carlow GAA, I had missed a shot of this a few days previously, but was tipped off that it would be on the new Portlaoise short working of the 735. It duly appeared, if somewhat behind time, in Portlaoise at lunchtime on the 26th. Being on the N80 which is the "main" direct road from the north west to the south east, different vehicles do pass through Portlaoise on a semi-regular basis. If heading to/from the south east they have to pass through the town centre, as there is no link between the Abbeyleix Rd and the Stradbally Rd. This will change in the next 18 moths, as funds have been obtained to compete this missing link. 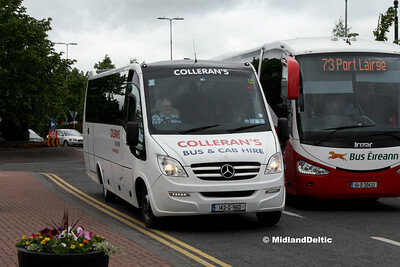 This Colleran's Mercedes-Benz midi is seen passing through the town on a private hire working on the 30th. JJ Kavanagh have now settled on Tourismos in the absence of right hand drive Setras being available. New earlier in the year, 171-KK-1466 is seen approaching the Portlaoise stop on the 6th with a Limerick – Dublin Airport service. While all branding and literature for this service is in the JJ Kavanagh name, it is actually operated under the licence of Kenneallys of Waterford. In UK journey planners, this type of situation is covered by using an “alias” field giving the operator name as it appears on the bus, to aid potential customers – usually where a trade name is used instead of the name on the licence. The NTA apps however do not appear to have such a facility, and the Kenneallys name appears on all NTA/TFI information. 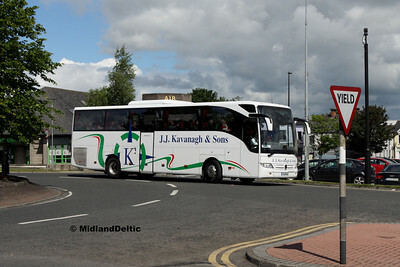 Unaware customers will look in vain for a bus in Kenneallys colours – hopefully none have missed their bus! Another import by Universal PSV, and one which comes from my former Peak District stamping ground! 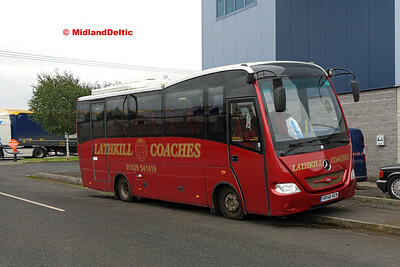 Lathkill Coaches appear to have ceased operation, and the vehicles sold off. This, together with another vehicle, was to be seen at Universal PSV on the 16th awaiting certification and re-registration before presumed onward sale. 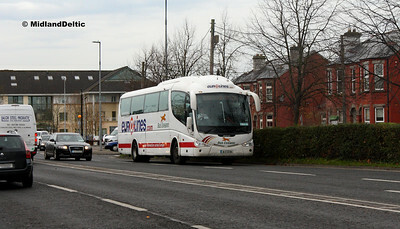 Several former Bus Éireann vehicles are still resident at Universal PSV. Some shunting has taken place to allow a view of the former VWL5, being gradually stripped of parts. An unusual visitor on the 2nd was this Ayats Bravo of Dave Long, with a party for the Dunamaise theatre on behalf of Travelmaster. 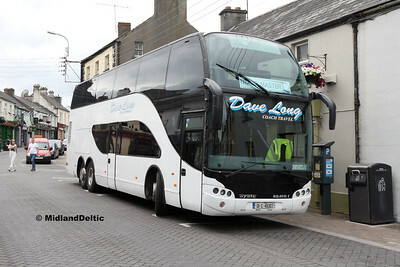 It is seen parked at the lower end of Main St in Portlaoise. The future is here! 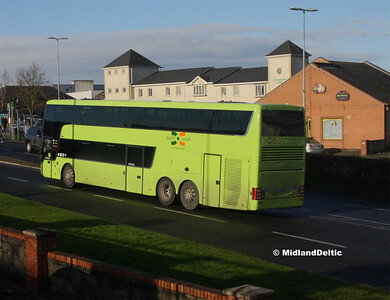 Maybe.... Astromega 09-KE-17667 is seen after arrival from Dublin Airport, replacing a Neoplan on the route. However, it was a relatively isolated occurrence, and Neoplans – or single-deck substitutes – continued to form the mainstay of the service. Of course, these vehicles are not themselves new, but are newer than most Bus Éireann operated vehicles trough the town; they are ex Megabus or other Stagecoach company, and still have interiors from that operator – including such things as the CCTV operator notices! Relegated to schools and closed-door private hires, this ex Stagecoach Busways Olympian was a welcome surprise in Nottingham City Centre. Operated by Lowes, it is between workings on a Kimberley Comp service – one which, many moons ago, I would have had a hand in organising! While at least the vehicle is still usefully occupied, the mentality of “it’ll do for schools” prevalent in the industry, and indeed through the PSVAR legislation given official credence, does seem to me to be shooting the industry in the foot. Childhood years are formative, and even if local services have all singing, all dancing low floor super-buses, without commenting on this particular bus or operator if the kids’ main interaction with buses is an ageing, third-hand, noisy trial to travel in, no amount of fancy branding and trendy names will deter said kids from applying for their driving licence on their 17th birthday; and then they are lost for life. 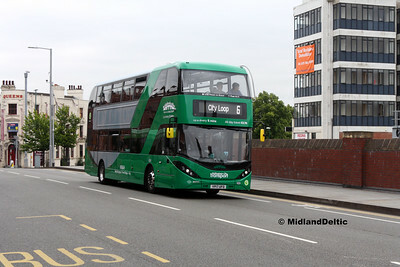 One of the main targets while I was in Nottingham was to see and ride on some of the brand new bio-gas buses which had recently entered service with NCT. Obviously inspired by the Borismaster, but with some nods to the Nottingham Standard, these buses illustrate a severe difference of opinion between NCT on the one hand, and their majority shareholder in the shape of Nottingham City Council on the other, who are following a pure electric solution for many tendered services. 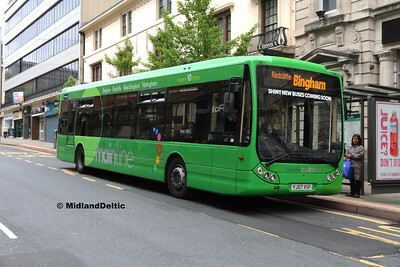 This example is seen on the 25th heading along Carrington St towards the city centre. A shot at the entrance to Parliament St depot on the 29th, this view encapsulates the changes to the NCT fleet over the past few years. The Scania / East Lancs Omnidekka has been a staple of the fleet for several years, even after the merger of Optare and East Lancs, was ousted by the Alexander Dennis Enviro 400, as seen on the right, with two batches of these arriving. The arrival of the gas buses, and the desire for them to be seen as different, has resulted in the Enviro 400 City body being ordered. The chassis remains Scania, a relationship which nearly started as long ago as 1981 with the purchase of former demonstrator NRR400W; after a dalliance with underfloor engined Volvo Citybuses, and previous standardisation on Tridents, Scania have finally established themselves as Nottingham’s preferred supplier. 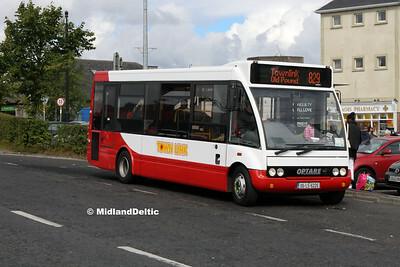 Optare Tempo 311 is seen on Friar Lane on the 29th, in its final few weeks of service with TrentBarton. The Tempo has not been a great success with only 250 odd right hand drive buses built; its predecessor, the Excel, was also not hugely successful, the sure touch that the Solo has been deserting the company for heavyweight saloons. Not the best shot in the world, but here we see 904 in “Pride” vinyl participating in a Pride event after being part of the march earlier in the day. We had seen it part completed outside Trent Bridge works a few days earlier. 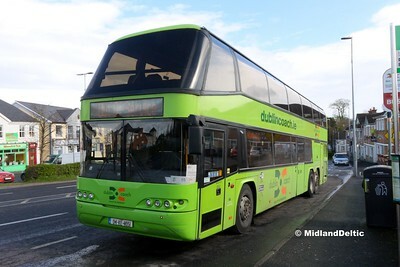 All of Slieve Bloom’s Townlink services are now low-floor operated, most with Solos such as this short narrow version seen on service 829 to Tullamore via Portarlington. 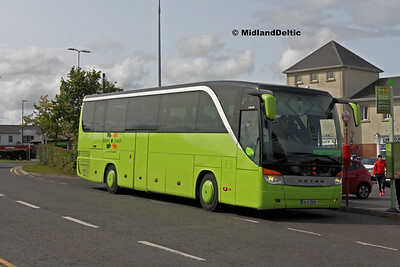 The exception in terms of vehicle type is the other route to Tullamore, that via Mountmellick, which utilises an MCV bodied Volvo B8R. 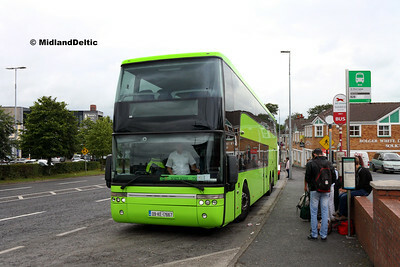 And still Dublin Coach Neoplan unavailability leads to the use of inappropriate high-floor coaches on the 726. 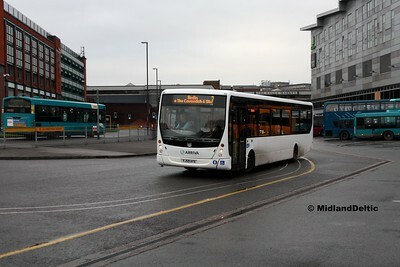 This ex Aircoach example is seen picking up at the start of the journey on the 23rd. The first weekend in September is Electric Picnic time in Co Laois. 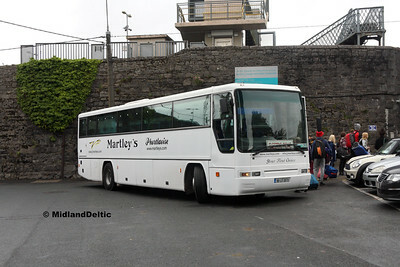 As in previous years, local operator Martley’s operated a shuttle from Portlaoise station to the festival site in Stradbally, around five miles away. 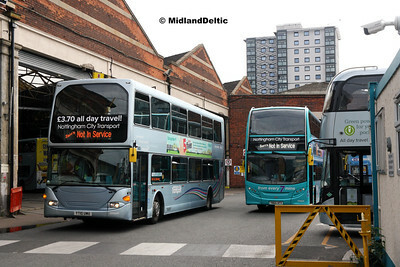 A new arrival is this imported Scania //Irizar, seen waiting to access the station for another loaded run to the site. Most of the festival traffic was routed around Portlaoise, so I went down to Ballybracken on the N80 to view what was happening. The imposition of a one-way system meant that I only saw buses and coaches leaving the site, and the sun was awkward, but nonetheless got reasonable shots of a wide variety of vehicles. One of the highlights was this ex Dublin Bus Volvo, now with Bluebird of Coolock. While I appreciate the sight, running 50 miles down the N7/M7 at 45mph must have been a little tedious for both passengers and driver! Monday 4th was the return day for the Picnic, and the major movement of people away from the site. This operation started in the early hours, and was actually winding down by the time daylight appeared. Martley’s Paxton Premier bodied Volvo is seen at the railway station on shuttle duties, 21 years young but still looking smart. Over to Ballymaken, and the traffic was somewhat freer then Friday; the weather was also less welcoming! 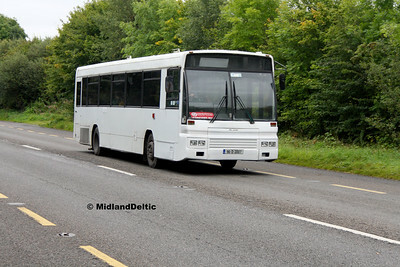 Here we see ex Dublin Bus 96-D-2007, now with McWeeney of Carrick on Shannon, returning from the festival sight. I’m not sure what people who booked through Marathon Travel for a coach to the Picnic would think of it, but I was quite pleased! 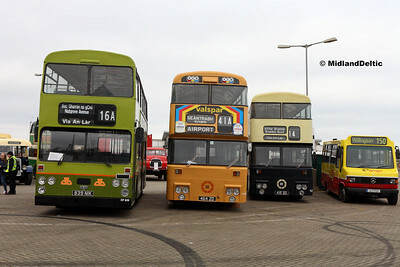 The East Lancs Mylennium body is not common in Ireland, although Bus Éireann did have a batch which are now being withdrawn. This imported example is with Melvyn, Lucan, smartly turned out. Again, hardly the coach travel that passengers may have been expecting, but on the return at least after a weekend partying I suspect sleep was high on the agenda! 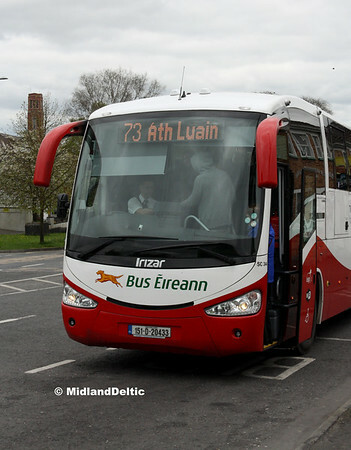 A real rarity here – a Bus Éireann coach registered in Laois, operating in the county! Released from school duties, Volvo/Plaxton VP89 is seen heading away from the site. Given the age, it probably only has another year left in service at this stage. Winner of the ugly prize of the year! 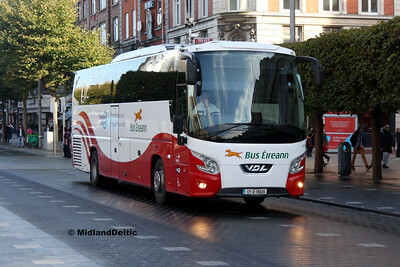 I’m not a fan of the “Streetdeck” front, but the Bus Éireann livery does almost hide the worst excesses of the thing! 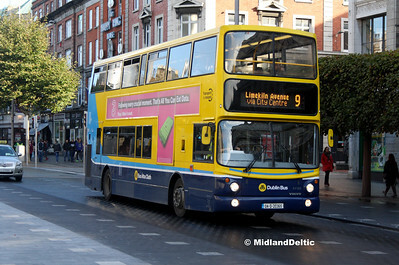 Brand new VWD79 is seen on O’Connell St Dublin on the 21st, with an inbound service 103. I was hoping for one of the last DDs, but I was to be disappointed on that score, and did not have time to wait around for further workings on this occasion. Also a first for me on the 21st was this LC300. LC322 is seen working a 101 from Drogheda, dropping on O’Connell St. Maybe I’m getting old, but the designers these days seem fixate with putting useless mouldings on bodies, which will date terribly IMHO – compare the “winged” headlight clusters with the classic clean lined Plaxtons above, for example. 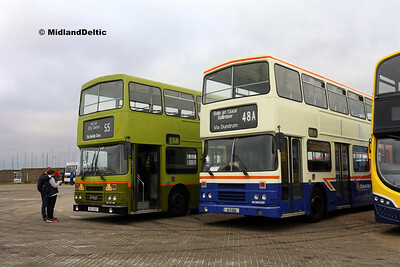 The ALX400 body is now in retreat with Dublin Bus, as new Wright-bodied Volvos flood the streets in every increasing numbers – indeed the change was noticeable between this brief visit and another at the end of October. So here we have AX365, with a Dublin spec ALX400 body on Volvo chassis as a reminder that all things change. SEs have occasionally appeared on the X12, but not too often. However, carrying a special livery for a musical show celebrating the Rising, SE20 visits the town on the 14thwith a private hire, again to the Dunamaise theatre. A highlight of the year for me was to travel on the “Munster Double” railtour from Dublin to Cork and Tralee on the 14th– see my Rail Review of the Year! However, buses did get a look-in. 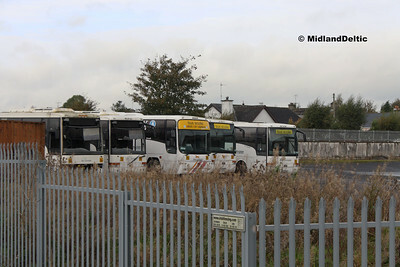 A photo-stop at Thurles gave the opportunity for this shot of buses parked in the Bus Éireann depot adjacent the station. Some detective work was needed to identify them all! Thurles is purely a school bus depot, with no public workings, and as a result is home to some elderly and non-standard stock, hence the “Christmas tree” nature of a couple of these vehicles. 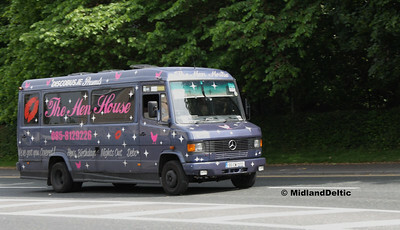 In addition to cascaded coaches, Bus Éireann does have some vehicles bought specifically for school work. These are based at various locations. Here we see BS8 parked up at Tralee. The basic travel offered by these American-style vehicles does little promote public transport to impressionable young minds, while car ownership is an “aspirational life choice”. 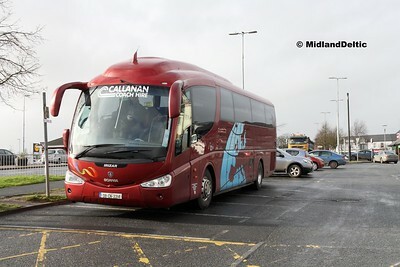 Another schools vehicle at Tralee was this elderly Volvo/Caetano, stored at the depot. Some Vcs do survive in service on schools work, but I believe that there on none on regualr service work at this stage. October was a busy month, with a trip to Dún Laoghaire for the Harbour Bus rally and a model railway exhibition. 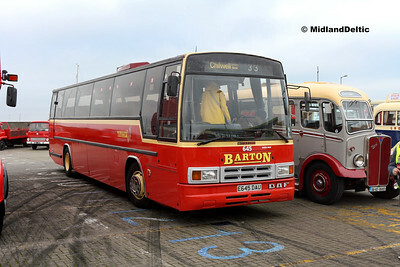 One of the first vehicles to catch my eye was this old friend, former Barton 645, now preserved in Northern Ireland after service with PAB Tours based in Dublin. I remember these being the best Barton had to offer at the end of their time as an independent concern, getting on local work was a real treat. 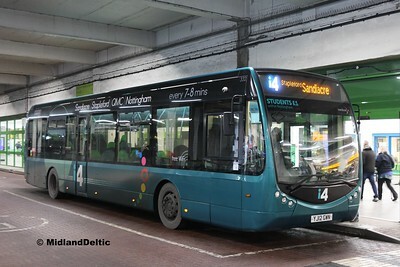 Unfortunately with the new Wrightbus front, this vehicle still looks quite smart, and the interior is to a high spec. The company maybe should consider their name now though, as this (and several other of their buses) really don’t qualify as “mini”! 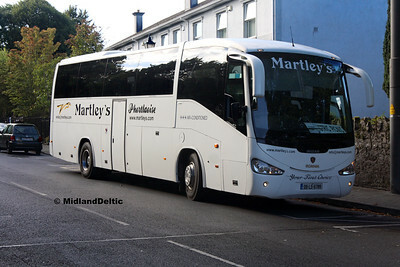 However, it is good to see a strong livery on an independent, rather than the "dealer white" which often prevails. Nowadays it is the ALX400s in retreat and being chased by enthusiasts. When I moved to Ireland in 2007 it was the R-Type Olympians in that position, with decreasing numbers on peripheral and low-priority routes, and in quite ropey condition internally at times. Here we see two such vehicles which have survived the axe, in two of the earlier liveries carried by the class. The paint on 91-D-1091 was barely dry, as it had only been completed in the week prior to the rally. It looked great, and deserved the plaudits that went its way. I grew up with Atlanteans carrying unique bodies, being from Nottingham. 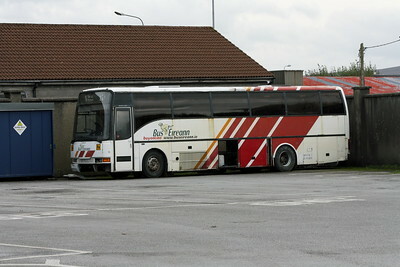 CIÉ also had their unique designs, both of their own building and from Van Hool/McArdle. Three of these line up at the rally on the 28th. A relatively unusual visitor to Portlaoise on the 31st was Eurolines liveried SP87 on an X12 working from Limerick to Dublin Airport. Towards the end of the year, there was more evidence of Astomegas on the 726, but still not in the majority from my own observations. 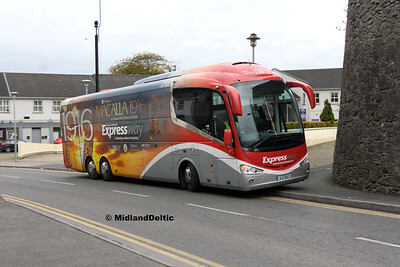 Here we see one on the 28th leaving the layover point to pick up for its next journey to Dublin Airport. The branding on these is certainly minimal! The LocalLink brand was formally launched at the National Ploughing Championships in October, covering generally rural services supported by the NTA in a rebranding of the former Local Transport Partnerships. This has led to a number of previously anonymous minibuses from several local operators gaining the branding, giving a quite different picture as to the availability of public transport. It is a pity therefore that dragging information on these services out of the NTA journey planer is akin to getting blood out of a stone! 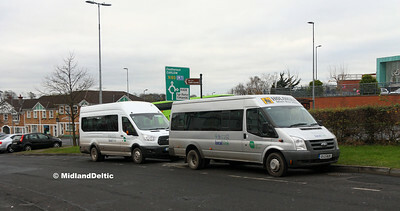 Two Ford Transits are seen with the branding between duties in Portlaoise on the 5th. 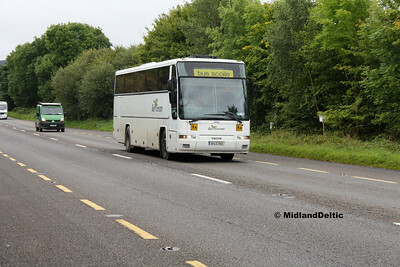 Following the strike, and the agreements thereafter, hiring in of buses became rare, at least on services through Laois. However, on the 12th Martins of Limerick were operating this X12 on behalf of Bus Éireann, with this Van Hool seen picking up in the town centre. 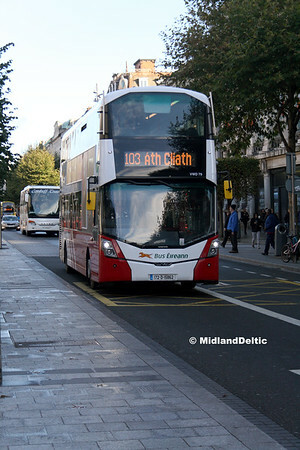 Ironically, it is actually newer than all the regular vehicles used n this route by Bus Éireann. 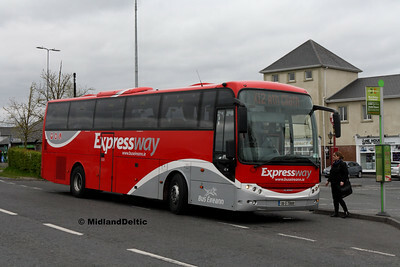 Despite motorway competition from Dublin Coach and Eireagle, together with a parallel JJ Kavanagh service, Bus Éireann seems unwilling or unable to develop the X12, with increasingly elderly vehicles and a relentlessly contracting timetable (Friday / Sunday extras disappearing during the year); it looks like the service is dying a slow, drawn out death. Between Portlaoise and Dublin, Expressway is barely competitive on time with Kavanagh to the city, and both Kavanagh and Dublin Coach to the airport; and in terms of spread of journeys (particularly important for an airport service) come a poor third. On fares too, Expressway is uncompetitive. Whether there is the will, or ability, to fight back is a question not yet answered. It's been an interesting year! A new job means I will be more constrained in my photographic activities next year, but willdo my best to keep the interest up! Happyy New Year, and here's to 2018!